Oh my God, fellow reviewers wherever you are, you are the kind of people expected to stay away from common drawers to file music in...! To get the "Latin" thing done first: Well, Jan Fride is a person capable of playing any drum and percussion style - and using stylistic elements of "Latin" drumming in a tune called "Urlaubsmusik" ("music for vacations") does not make a record one "in Latin style"... So, now let’s start with "Through"! Already before you start to listen you get two pieces of information: First, the cover is showing an adaptation of a tour poster from 1972, just the faces of the musicians have aged (respectivly changed as the line up of the band). Second, the title is "Through" which might lead to questions concerning its meaning: Are they "through" with it - even a strategic similarity to Steely Dan’s "Everything must go"? - indicating that they’re going to close their musical "shop"? 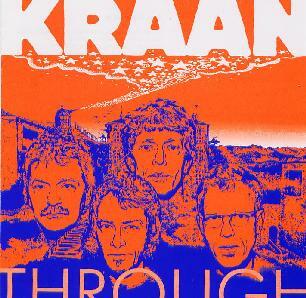 In a quite specific way Kraan are really going back to their beginnings and are coming to some kind of an end. But let’s have a look at it in detail. First of all the record is "old fashioned" in a very likeable way. It’s a band performance, mostly done live in the studio with few - if any - overdubs and no "Pro Tools" editing or things like that. Well, you get to hear what a Rock band is able to deliver to its audience by means of musical inspiration, instrumental control and joy of playing. Second, we don’t get a "Hellmut Hattler plus band" record but a really convincing group performance with strong elements of musical "togetherness". Third, there was always a specific way of Kraan’s incorporation of Jazz elements into Rock tunes, not really Jazz Rock in the style of the famous "fusion" bands and musicians (who have redetected the "modes" of ancient Greek and medieval sacred music for Jazz and commerciality, calling the whole thing "modal Jazz" and "fusion music"). Here we get a subtle mixture of many stylistic elements, among them modal scales and - yes - even "traces" of Latin music, that’s quite unique in the sense that you can tell Kraan from any other band. If you don’t have an "analytical" approach toward music in the sense that you try to detect its construction principles, but rather give it a listen to enjoy without an theoretical "supra-construction", you won't be disappointed either. "Unser Lied" ("our song"), the opener combines the strength of a Rock tune with the subtleties of mature romanticism and is one of the standouts of the CD. A bit alike is "Slomocean" - what a cool play on words and another standout - getting even deeper into the spheres of feelings and reflections. The already mentioned "Urlaubsmusik" is some kind of "easy listening" for lovers of demanding music, not the middle of the road thing you might expect to hear on the air, well, everybody needs a vacation every now and then, why not a mental excursion to nice places in the middle of a Rock CD? "Moxx" is a tune only a band can play that has fought all fights and knows everything about loosing and winning, leading over to the title track "Through" - a tune that draws a sum: you get the whole Kraan in one tune (the only one on this record with a dominating Hattler on bass guitar), you can see pictures of farm houses (where the band members used to live as cummunards in the Seventies), rehearsing rooms, highway travels from one concert to next, you have elements of maturing, even aging, and - wisdom. For me personally the title track alone would have been a reason to buy the CD. I didn’t say a word so far about the tunes with vocals: I had to struggle with the way of singing and would have adviced to leave the vocals away, if anybody would have asked me ;-)) as the tunes would work perfectly without vocals - but this should definitely not let you not listen to the CD or buy it. If you're familiar with Kraan you won’t want to miss their latest recording anyway. You can visit Kraan’s website at www.kraan.de and the Kraan label at www.bassball.net.